The other night, after going over my new Anthropologie catalog, I really wanted to make something for myself. So I did. Now, I’m going to share with you how I made it. 1. Grab a shirt and some material that matches. I used a grey knit so I wouldn’t have to worry about the edges. 2. 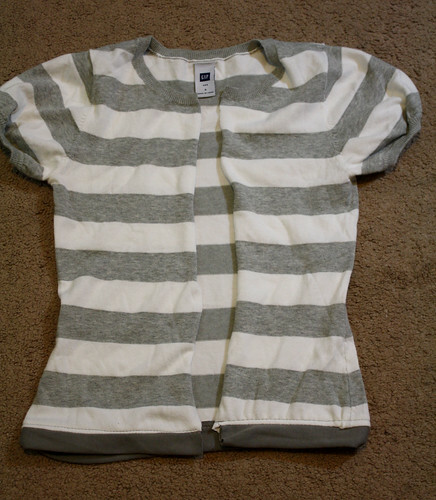 Cut down the middle of the front of the shirt. 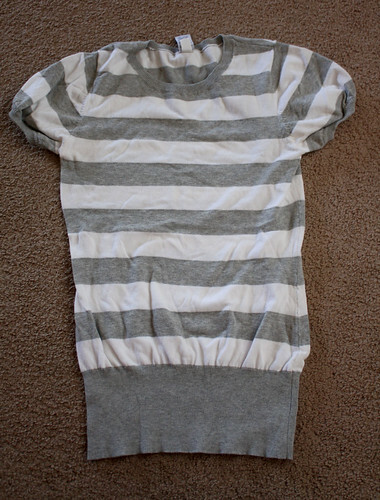 The shirt needs to also be at your waist, so if you shirt is longer, cut off some of the bottom as well. 3. If you cut off the bottom, you can quickly do a trim to cover up the edges. 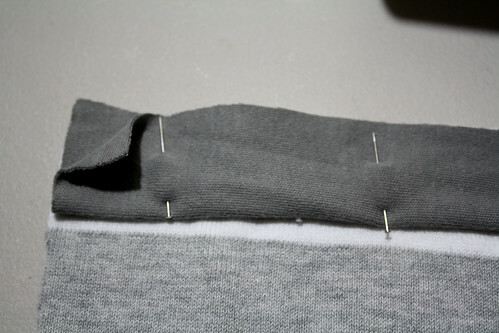 Cut a piece of fabric that is the same length across and then double the desired height. 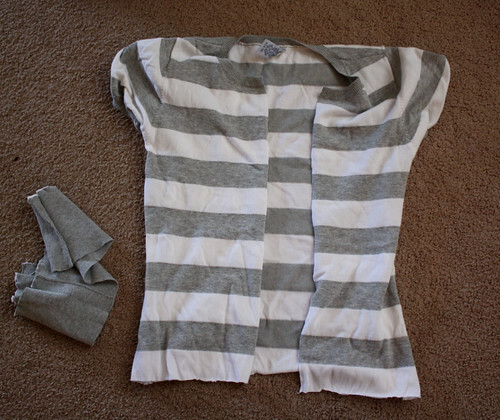 Fold the piece in half short ways and pin the raw edges to the shirt bottom, right sides facing. Sew it on. 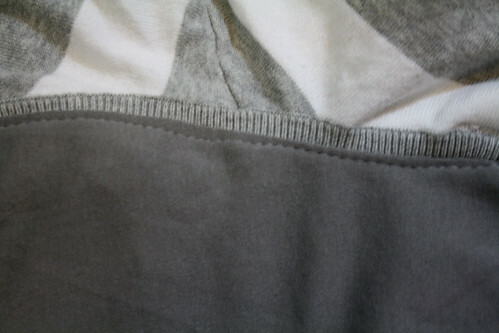 Push seam towards the shirt and sew a little above the seam on the shirt to hold it in place. 4. 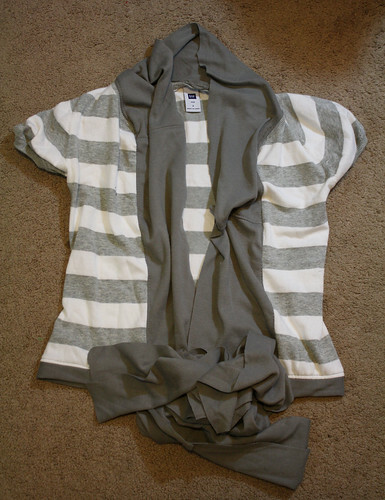 Cut a piece of fabric that will be long enough to go around the front opening and neck of the shirt and enough to wrap around you and tie in the back. For the width, it’s whatever you want. 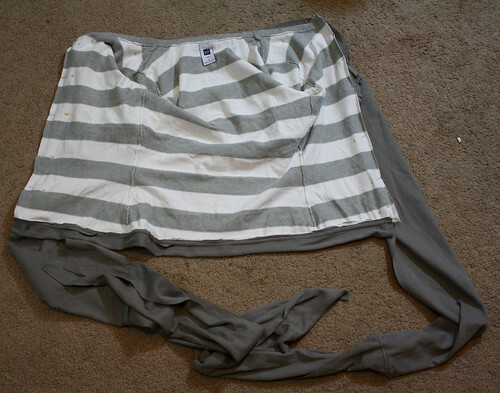 To make mine so long, I had to sew a few pieces together with the scraps I was using. 5. 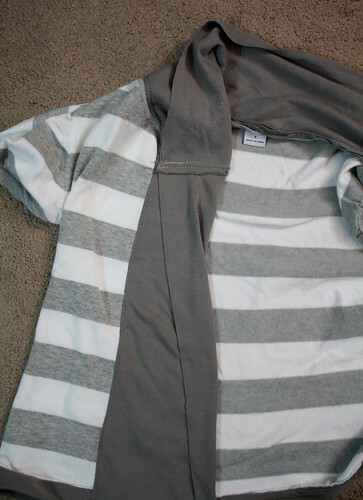 Pin the long piece all around the sides of the front opening and neck, right sides facing. 6. Sew it on. 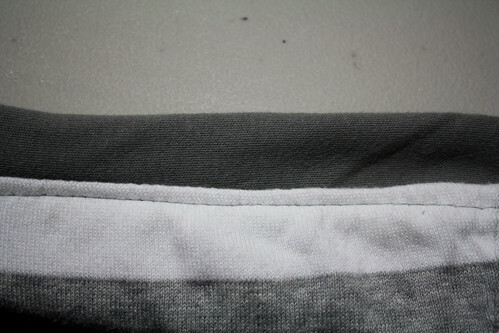 Then push the seam toward the outer fabric and sew close to the seam to sew the seam down. 7. If you want to add ruffles and all like I did, turn the front in some like this and pin pieces in place. I just made some things with the left over material I had, stood in front of the mirror with the shirt on, pinned it in place, then sewed it on. For wearing it, I tied it in the front and looped the ties in the back and tied. Love it! So awesome. You’re so creative and genius! You need to enter this into the Ruffles n Stuff contest!! You did such an amazing job. And your hair!! *sigh* Looks like you definitely stood in the “fabulous hair” line in heaven. This is super cute! I really like it! I totally have that top…if I send it to you can you switch mine up too? :) It looks so great! Wow I love it, it looks great on you too!! I ADORE this top! I really need to make one too! And your tutorial and pictures were so well done too! Thank you! Seriously, how cute are you! I LOVE this!! Yet another project to add to my “When I Learn How to Sew” list. Which is no good, because I have to take my girl to the gym. Well then, tonight I’m going to have to push aside my other sewing projects to do this. I love this cardi! It’s amazing! Wow love this. You are so creative. That is adorable! My favorite part is the ruffles. I can’t sew for the life of me. Too cute! You make it look so simple. Cool Cardigan! And seriously, you are so gorgeous. Wow! That is so cute! 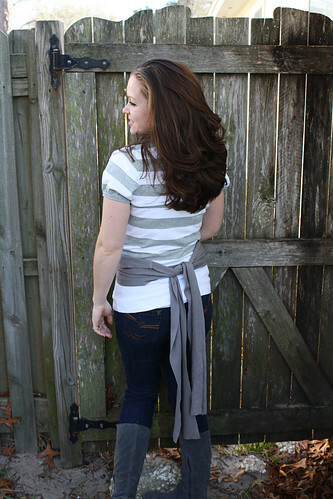 I love how it ties in back!!! Love it!! So cute and you could do anything with it! Thanks so much for the cool ideas! This is so, so, sooooo cute! I love how it ties in the back, adorable. 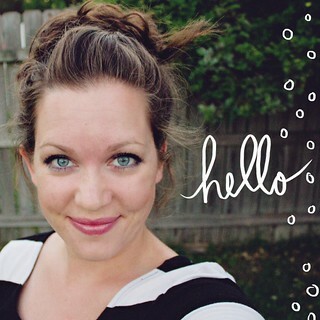 Thanks so much for sharing, I’ll be linking. Love this totally..and you pull it off so nicely, thanks so much for sharing!! i love this!! can you show more how you did the ruffles? Wow Jessica, this is darling! I would have had no idea you made this, it’s so cute! I’d like to share a link on sewwhattoday.blogspot.com on June 19! I just made this and love it! 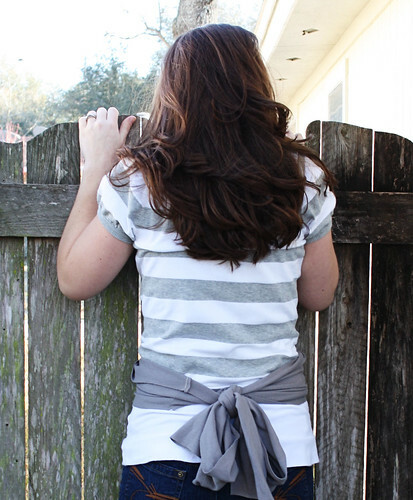 Plus, its so easy to do and a great way to add something new with something old.